About a week before Christmas, T and I had one of our rare days off together. 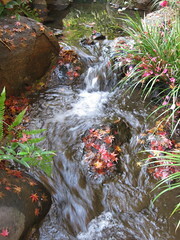 So we made the most of it and explored some more of Shirokane, a neighborhood near our apartment. I recently wrote about its street of gingko trees. 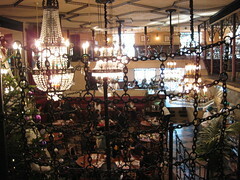 First we went to our favorite restaurant there, La Boheme, for lunch. It’s really one of the few places we can afford in that over-priced neighborhood. 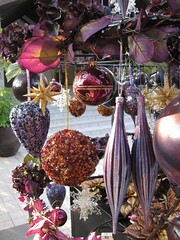 Yet the decor is quite lush and luxurious. Although, there is somewhat of a gothic haunted mansion vibe about the place that’s a bit cheesy. Sometimes, there’s an accordionist, and once there were a pair of violinists. It’s actually a chain, but the service is always superb, and the food is very good. I recommend the gorgonzola and honey pizza. The arabica pasta is also tasty. Then we decided to check out Happoen, which is a private garden that is rented out for weddings. 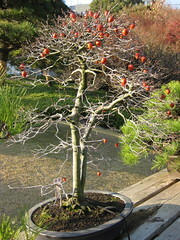 It’s a traditional Edo style garden that used to belong to a local lord. There are a couple chapels, a restaurant, and cafe, and the huge gorgeously maintained garden. Because it’s not a public park, there were few people there. The sign at the entrance says only customers and guests are allowed, but we went in anyway. No one seemed to mind. I suspect many locals go there to chill out. In Happoen there is a path lined with bonsai that are hundreds of years old, and a pond that reflected the surrounding trees in a way that created the surreal colors of an impressionistic painting. 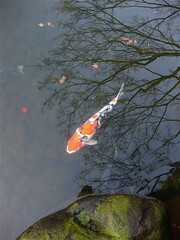 I spent a long time photographing the carp. T teased me about this because I have this fascination with them. I’m mesmerized by the way they slither placidly under the surface of the water. It’d been a long time since we wandered around Shirokane. Even though it’s near our home, it’s not really our kind of place. Lots of rich matrons walking their spoiled ornamental dogs, sipping $10 coffees in pretentious cafes. It kept us from visiting this gem of a garden. And we also never noticed that there was a bookstore with a huge inventory of used English-language books. The bookstore is called Book Off, an ubiquitous chain of bookstores specializing in used books, usually all in Japanese, and mostly manga. But apparently, they also buy used English books (and several other languages too) and they all get sent to this one branch, which is bizarre because Shirokane is definitely not known as a place where foreigners live. Most of the books are 300 to 500 yen. So it’s cheaper than any other used English bookstore in Tokyo. Plus, it has a nice cafe, so it was the perfect way to end our date: kicking back with our stack of books, sipping coffee, watching the languid locals be walked around by their Hiltonian pooches. 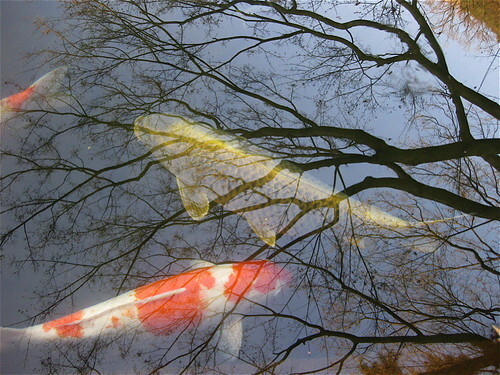 The photo at top showing the reflection of the trees in the pool of fish is incredibly beautiful. thanks! the pond was truly special. the light, the surrounding greenery, and the calm carp, all contributed to an unreal beauty. i’m definitely going back.